This brazen murder sends a chilling message to all who are working for justice in Honduras. The Friendship Office joins the family of Berta, COPINH and the Coalition Against Impunity in Honduras in their demand for an independent and international investigation of this political murder. 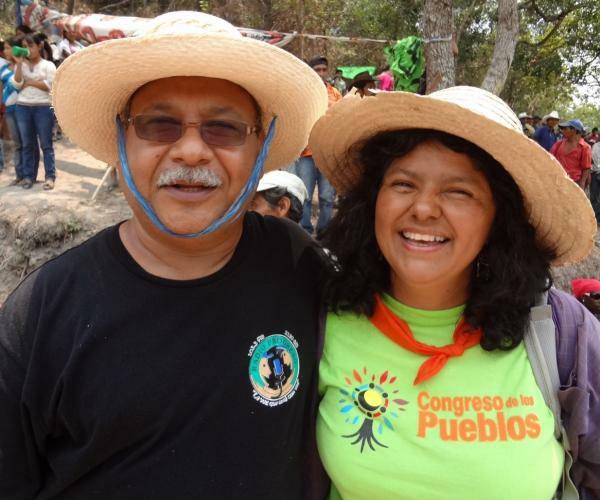 I write to share with you the pain and rage I am left with, we are left with, due to the murder of Bertha Caceres, a leader of grassroots efforts in the struggle to defend the environment and indigenous peoples. She and her organization, COPINH, confronted multinational companies from China, the United States, and Canada, bent on exploiting natural resources, particularly rivers and minerals. Last year she was awarded the Goldman Environmental Prize. She was a friend, a sister, a companion of Radio Progreso and ERIC, and we had a particular history of close friendship and common struggle. She represents many of the shared struggles of indigenous people, feminists, of the popular movement, of grassroots communities, and environmentalists. We are beaten down. She was constantly threatened. Being a woman with the highest international recognition among the social and popular movements in Honduras, her assassination shows and lays bare the helplessness of people and organizations fighting for human rights and the defense of the natural resources and against the sale of national sovereignty. She fills us with pride. But her assassination leaves us shocked. I send my embrace and trust in your trust in your solidarity in the struggles in which we continue. From today on with loyalty to Bertha Caceres, our sister and traveling companion.